ID Number ID is automatically generated number by Shopify to identify the item. It is filled in by an Export. When creating new Discount, leave this value empty. Title Text Title of the Discount to show in Admin. This is not a discount code – it’s the name to call all of the discount codes of the same kind. To set the discount code, fill the “Code” column. If you will not import the Title column, it will get automatically set to the same as the Code from the Code column. NEW: will try to create a new Discount with the provided details. If such Discount will already exist (with the same ID or same Code), then the result will be Failed. UPDATE: will try to find existing Discount, and update it with data from the row. If such Discount will not be found, then it will create new. REPLACE: at first, if such Discount with provided ID or Code exists, then the app will delete it. After that, it will create a new one. If an existing Discount will not be found, then still the app will create a new one. The difference from UPDATE is that it will not keep any of columns, which were not included in the import file since the Discount will be deleted and re-created. DELETE: the app will delete the existing Discount, which is found by ID or Code. If such Discount will not be found, then the result will be Failed. This DELETE command is very handy for deleting Discounts in bulk. Code Text Discount code that customers use at checkout. Required when creating a discount. You can have several discount codes for one Discount. To create several discount codes, duplicate the row with the same ID or Title. When exporting a Discount with several codes, each code also will be put in a new line. The maximum length is 255 characters. The code is not case-sensitive, which means that there is no difference if big or small letters are used. Used Count Number Number of times the discount code has been redeemed. This column will be only exported. This is the discount type. You can set one of three types: give percentage discount, fixed amount discount or free shipping. The same principle, as entering them through Shopify Admin. Discount Value Negative decimal number Here you provide the percentage amount for the Percentage discount or just amount for Fixed amount. The number should be negative. Minimum Purchase Amount Decimal number Minimum purchase amount for discount to be applied. Orders below the minimum purchase amount will not have discount. Limit Total Times Number Number of times this discount can be used. If TRUE, then each customer will be able to use this discount code only once. Max Uses Per Order Number Only for “Buy X Get Y” discount type: what is the maximum of allowed uses per order. Minimum Number Of Items Number The minimum number of items to purchase to apply the discount code. Can be used for all discount types, except for “Buy X Get Y”.The default is empty, which means 1. Starts At Time Date and time, from what the discount can be used. If left empty, will start now. Ends At Time Date and time, till what the discount can be used. If left empty, the code will never expire. Updated At Time This column will be only exported. It will be automatically updated, whenever you change the Discount data. These columns to be filled for Free Shipping discount type. Free Shipping: Country Codes Country Code Country international codes, consisting of 2 letters, to which free shipping to be applied to. To enter several country codes, you can either enter them in the same cell, separating country codes by comma. Or you can create new rows with the same Discount Code value, and have each country code in its own row. It is important, that each Country Code is added to at least one Shipping Zone. You can do it in Admin: Settings -> Shipping -> Shipping Zones. Use “*” to apply free shipping to the Rest of the World. Free Shipping: Over Amount Decimal Number Amount starting from what free shipping will be applied with this discount code. In these columns you can specify additional parameters for discount code to be applied to. To give discount to particular products, variants, collections or customer groups. Number Applies only for ‘Buy X Get Y’ discount type. Number of items customer have to buy to receive discount. Comma Separated Handles Applies only to “Buy X Get Y” discount type. The Handles of linked Collections that customer buys to apply discount. This allows copying Discounts between shops, too. put each Collection Handle in its own new row, by duplicating the same Discount Code for each row. To see the Collection Handle, you can export Collections and find Handle in the Export file. Or you can see Collection Handle as the last URL part when looking in Admin into SEO fields section. The Handles of linked Products that customer buys to apply discount. This allows copying Discounts between shops, too. put each Product Handle in the new row and fill in Discount Code with the same code for each row. To see the Product Handle, you can export Products and find Handle in the Export file. Or you can see Product Handle as the last URL part when looking in Admin into SEO fields section. Comma Separated Handle|SKU combination Applies only to “Buy X Get Y” discount type. The Handle|SKU combination of linked Product Variants that customer buys to apply discount. This allows copying Discounts between shops, too. put each Product Handle|SKU in the new row and fill in Discount Code with the same code for each row. To find Product Handle|SKU combinations, you can export Products and take from “Handle” and “Variant SKU” column in the Export file. Or you can see it in the Admin. To list Variant IDs, you don’t need to enter Product Handles – otherwise, it will apply the discount to the whole Product as well. Shopify limit is 100 variants for each discount code. Number of items customer will receive the discount for. Applies To: Collections Comma Separated Number The Handles of linked Collections that customer gets discount for. This allows copying Discounts between shops, too. Applies To: Products Comma Separated Number The Handles of linked Products that costumer gets discount for. This allows copying Discounts between shops, too. Applies To: Variants Comma Separated Number The Handle|SKU combination of linked Product Variants that customer gets discount for. This allows copying Discounts between shops, too. Applies To: Customer Groups Comma Separated Names List of customer groups, which can use this discount code. put each Customer Group in the new row and fill in Discount Code with the same code for each row. You can find your customer groups in Shopify Admin, Customers section. To define a new customer group, create a new saved search. Applies To: Customers Number Shopify generated Customer ID. If specified existing customer ID from that store, Order will be linked to that customer. put each Customer ID in the new row and fill in Discount Code with the same code for each row. When you want to bulk update existing Discounts, you need to have either ID, or “Discount Code” column (whichever comes first), because it will search for existing Discount by this “key”. 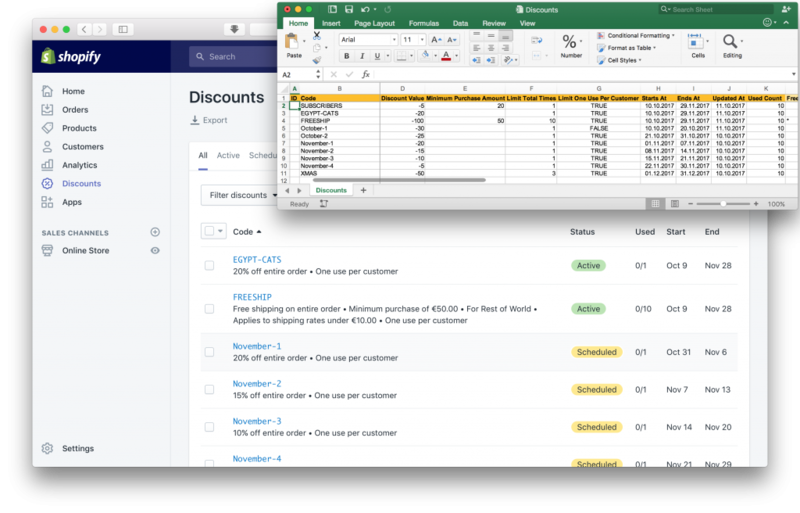 To update only some columns of existing Discounts, remove those columns from the Excel file, which you don’t need to update. Then the Import will not touch them. If you will have the Column with an empty value, then this field will be changed to empty. When you copy Discount codes from one shop to another, if they have related Collections Products or Variants, make sure that those exist in your other store, too.